Innovative technologies have revolutionized the business world over the last 20 years. Smartphones, social media, search engines, information storage and digital photography have created an entirely different business and communications environment since 1992. Personal assistants - the real, human kind who used to answer phones and schedule meetings - have been replaced by scheduling software and the instant accessibility of mobile phones, email, social media, instant messaging and texting. Almost anyone can be reached anywhere at any time. While the floor covering industry has taken advantage of those technologies, just like every other industry there's also been rapid innovation in manufacturing over the last 20 years, often the result of changing tastes, economic realities, or simply the need to create a better product. For example, hardwood with knots and nail holes was considered a defective product in 1992. Today, character wood is one of the most significant style trends in hardwood flooring. Click systems weren't yet invented in 1992, but in 2012 they account for significant portions of the laminate, hardwood and LVT markets. And Saxony carpet, with its footprints and vacuum tracks, has been replaced with textured carpet, which offers greater durability. Here's our list of the most significant innovations in the flooring industry, as well as a number of developments pre-1992 that became widely accepted the last two decades. Texture innovations advanced soft surfaces beyond Saxony (cut pile). Saxony was soft but it showed every footprint and vacuum track. Newer textures that incorporate fiber with added twist and crimp were introduced into carpet styles called "trackless", which ultimately evolved into what we now call friezes. The technology used a Stuffer Box developed by Superba. The transition also resulted in greater variety for the consumer. Continuous filament fiber has taken significant marketshare from staple due to its lower cost and improved uniformity. The labor costs to produce staple fiber are twice as high as bulked continuous filament. While BCF technology has been evolving since the mids 80x, it was the ever increasing costs of polymer along with the continued advancements in extrusion technology that drove the carpet producers to make the investment to convert their fiber processes over to BCF. The fact that it doesn't shed like staple fiber offers a significant benefit for the consumer. Multiple factors have led to the rapid growth of BCF polyester. Pricing for nylon chip has continued to rise as nylon car parts have increased in popularity as a lightweight alternative to heavier metal parts. While nylon is still heralded by many as the best performing synthetic carpet fiber, carpets made with nylon can no longer meet the price points where much of the volume is generated at retail. Polyester, on the other hand is a much cheaper polymer and the global capacity to produce polyester chip is abundant due to its wide use in apparel markets. In addition, extrusion technology has advanced (with the development of the Neumag S5 extruders) along with the heatsetting equipment that gives the fiber bulk and twist. So the polyester BCF fiber used in carpet today is much more advanced than the fiber of the 80s and 90s. 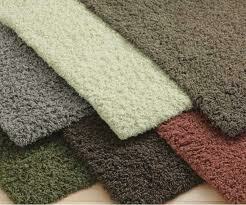 The first evolution in carpet backing came when the industry shifted from jute to synthetic fibers in the 70s. But in the last 15 years, producers have discovered that more substantial materials could be attached to carpet in the coating process to enhance the carpet's performance and bring added value to the end user. The most widely used example is SoftBac, which Shaw Industries developed with Synthetic Industries (which Shaw later acquired). SoftBac offers a host of performance advantages. It's more dimensionally stable than standard carpet backing so it reduces the need for installed carpet to be restretched, and it reduces potential damage to walls and baseboards during installation. When carpet tile was first developed for the commercial market, vinyl was most commonly used on the back for dimensional stability. But as Shaw sought to find a PVC-free alternative that could be recycled into carpet backing more than once (cradle to cradle), the company developed EcoWorx - an olefin based material that it now uses on the majority of its tile products. DuPont created a new class of fiber with its triexta, a PTT polymer that has superior resilience and stain resistance to polyester. About 37% of the fiber's composition comes from corn. The fiber is marketed by DuPont under the Sorona name and is sold exclusively to Mohawk for residential carpet, called SmartStrand by Mohawk. The fiber is also available in the commercial sector from several different carpet producers but has not yet achieved wide acceptance. Anso's Caress and Stainmaster's Tactesse were the first soft fiber products with approximately ten deniers per filament in 1998. Today, Invista's TruSoft is four to five deniers per filament, the thinnest nylon carpet fiber on the market. Earlier this year, Mohawk introduced SmartStrand Silk, which is a fine denier fiber made out of triexta. Servos originally were incorporated into the tufting process to enhance product and setup reliability, and they also made setups easier and quicker. However, servos soon began to be used to create patterned carpet by allowing for better control of yarn in the tufting process. Today, servo control allows for better carpet styling and constructions, and makes operating a tufting machine more efficient. Precision cut/uncut creates sophisticated styles similar to the look of carpet produced on a Wilton Velvet loom. It can combine rows of cut pile and uncut loops within a tuft row in varying amounts, which makes it possible to produce a wide range of textures, geometrics, solids, or multi-colored patterns in any combination. It can also create tip-sheared effects without the shearing process. Cut pile and loop pile can be combined in the same tuft row and at essentially the same pile height without burying yarns. U.S. consumption of carpet tile has doubled in the last ten years, reaching over 80 million square yards of annual consumption. Today, carpet tile has a 36% marketshare in dollars compared to broadloom in the U.S. commercial market. The key benefits of carpet tile include compatibility with open office systems, design flexibility, reduced installation time, ease of shipping, reduced waste, low carbon footprint, and improved lifecycle performance. Backward integration into backing started with Carl Bouckaert when Beaulieu ventured into this area in the 80s. But it wasn't until the mid 2000's that the two larger carpet mills made a move with major investments. Within a year, starting in 2005, Shaw bought Synthetic Industry's plant in Chickamauga, GA and Mohawk bought Wayn-Tex in Waynesboro, VA and a Propex plant in Roanoke, AL. Beaulieu also led the way in making its own carpet yarn, dating back to the late 70s. Shaw and Mohawk picked up some extrusion capability along the way with several of the acquisitions they made in the late 80s and through the 90s. Mohawk's fiber integration got a big boost with the acquistion of Image in 1999 and it's been incrementally adding its own extrusion equipment ever since. But it wasn't until 2005 that Shaw picked up much of its nylon 6 capacity with the acquisition of Honeywell's nylon plants. Today, independent yarn suppliers like DuPont and Invista keep themselves viable through innovation (creating new fibers like triexta and TruSoft). Universal Fibers and Aquafil also remain nimble suppliers of specialty performance fibers. The Evergreen nylon recycling plant in Augusta, GA was built in 1999 as a joint venture between AlliedSignal and DSM. The plant was shut down in September 2001 because at that time virgin caprolactam, a key ingredient in nylon 6 polymer, was cheaper than caprolactam produced from recycled carpet. Shaw purchased 50% of the plant as part of its Honeywell acquisition in 2005 and bought the rest a year later. In February 2007, Shaw re-started the plant and it now has the annual capacity to convert 100 million pounds of post-consumer carpet into 30 million pounds of caprolactam. Evergreen's ability to convert used nylon 6 back into the key components of carpet is exactly what architect Bill McDonough was referring to when he coined the term cradle to cradle. Last year, Aquafil opened a similar plant in Slovenia for the same purpose, offering 100% recycled content fiber. Mohawk released its Everstrand, a 100% post-consumer recycled content PET staple fiber, to the market in 1999. And in 2010 Shaw opened its Clear Path Recycling plant in partnership with DAK Americas to convert recycled plastic bottles into carpet fiber for Shaw's ClearTouch carpet products. Today, PET BCF fiber has grown to account for about 25% of the market. Although first produced over 50 years ago, engineered hardwood has been taking share from solid hardwood at a more rapid pace in the last 20 years. Last year for the first time engineered hardwood surpassed solid, taking a 51% share in dollar value. Engineered hardwood is composed of multiple real wood veneers bonded in a crossply construction. The resulting product has more dimensional stability than solid wood and is less susceptible to shrinking and bowing. In addition, manufacturing engineered wood produces less waste than the production of solid hardwood, creating greater yield from harvested wood. Character woods - handscraped, weathered, distressed, chattered, rustic and other looks - enhance the inherent grade and color variation found in real wood. Previously these "defects" were either cut out or relegated to the inner piles of wood floors, where they would not be seen. However, many of today's consumers appreciate the fact that wear and tear is more easily disguised in character wood floors than in traditional glossy hardwood, which makes them friendly for commercial environments or for residences with kids and pets. An estimated 85% of all hardwood flooring is now finished in the factory rather than on site. The wear surface of a prefinished wood floor is usually harder due to the aluminum oxide coating that can only be applied at the factory. This technology was first introduced on hardwood floors by Anderson in 1997. Another more recent driver of the growth of pre-finished flooring is that home construction is way below normal levels, and most site finished flooring is installed in new homes. The growing preference for engineered hardwood has also accelerated this trend, since most engineered wood is pre-finished. Seventy percent of solid hardwood is now pre-finished as well. Today's polyurethane finishes are rapidly cured in the factory under ultra violet light, replacing the need for slow drying solvent based finishes. This speeds up the production process significantly - one coat takes minutes rather than hours - and enables manufacturers to apply more layers of finish in less time, resulting in a more durable finished product. Mannington was the first company to convert to this innovative finishing system. Strand-woven bamboo was developed to overcome the softness of traditional bamboo flooring. It's made by shredding the bamboo fibers into strips, which are coated with phenolic resin and pressed into a mold with high pressure. The resulting wood has twice the hardness of domestic oak. The first mechanical locking system that didn't require spring clips was developed by Välinge in 1994. Alloc, in 1996, was the first company to incorporate the system into a product. Today, glueless installation systems account for 90% of all the laminate flooring sold. Besides eliminating the need for adhesives, these systems also speed up installation. Today, mechanical locking systems are also seen on engineered hardwood, LVT and some ceramic tile systems. Faus was the first company in the U.S. to earn a patent for embossed-in-register laminate flooring. This method of matching the texture of the surface with the grain lines or veining of the visual, makes the product look more like real wood or stone. Aluminum oxide is added to the melamine finish of laminate flooring to increase the product's durability. Products with aluminum oxide finish get improved Taber cycle (rate of wear) ratings. This process can only be done on product that is finished in a factory. High gloss or piano finish laminate flooring with an AC5 rating, the top durability rating, was introduced to the marker just last year. Armstrong's bio-based composition tile is created using Bio-Stride polymer, which is made from corn. The finished product contains approximately 3% bio-based content. Over one billion square feet of bio-based tile is installed annually. First manufactured in North America by Tarkett, fiberglass backing adds stability to resilient flooring, making it flexible and more capable of overcoming irregularities in the subfloor. In addition, fiberglass-backed resilient flooring is more durable than felt-backed vinyl. Now one of the fastest growing categories in the flooring industry, LVT was first developed by Congoleum in 1988. LVT products on the market today provide some of the most realistic looking visuals achievable using synthetic materials. LVT is composed of a detailed print design bonded to a solid vinyl carrier. It has durable wearlayers and greater wear resistance than standard vinyl tile. LVT is used in both residential and commercial applications, and comes in both tile and plank formats. First introduced to the market as Congoleum DuraCeramic, groutable LVT tile offers a look akin to ceramic tile without the weight or expense of installing real ceramic. For colder climates, it offers the look of ceramic, without being cool to the touch. The Continuing Growth of Porcelain in the U.S.
Crossville built the first porcelain tile plant in the U.S. in 1986. Before then, all tile produced in the U.S. was ceramic. Ceramic tiles, made from clay that's fired in a kiln are more porous than porcelain and don't provide as much strength. Porcelain tile, made by pressing and heating finely ground ingredients, is more suitable for commercial applications due to its increased durability. Digital printing revolutionized the ceramic tile industry, enabling realistic stone, leather, fabric, marble, and wood visuals, as well as new hybrid and design-oriented looks. The digital printer sprays the glaze, much like a digital paper printer, rather than applying it via a system of rollers. Digital printing is often used in combination with surface texture methods. A roller hearth kiln uses a conveyor belt to transport the tile through the kiln. This type of kiln has superior efficiency as well as a condensed firing cycle. The roller kilns in the early 80's could only produce 6 to 7 million square feet of product per year. Today's kilns can make 30 million square feet with fewer workers.